Here’s the sneaky thing about stuff: On the surface it seems harmless enough. We buy it because it’s pretty, useful, or enjoyable. But there’s a deeper reason we buy what we buy. As I look at all the items I own—literally thousands of items to my name—I realize that much of it tells a story about me. The bracelets I bought because all my friends were wearing them. The wall art that I hoped might reflect a certain Waco designer, but just doesn’t seem quite right. The furniture that was supposed to make me feel like a grown-up. The tennis shoes I was going to shed ten pounds in. The iPhone to keep me connected. The new iPhone because, let’s face it, the old one is embarrassingly outdated. The dishes for company, the hair bows for toddlers, the purses and lipsticks and lampshades . . . it’s all part of my story. Before I know it, it’s not just my home that’s cluttered—it’s my head; it’s my heart. Recently I watched Minimalism: A Documentary About the Important Things. I’d seen this film about living with less stuff advertised on Netflix for months, but I regarded it like a rare virus—fascinating from a distance, lethal up close. What Does the Bible Have to Say About Minimalism? In Jesus, we are enough. We have enough. We don’t need more stuff to be happy. As a matter of fact, the more we store up treasures on earth, the more our hearts are distracted from eternity (Matt. 6:19–21). No doubt this is why Paul urged believers to fix their eyes not on temporary things they could “see” (or wear, drive, download, etc. ), but on the unseen things that stretch into eternity (2 Cor. 4:18). Much as I loved the documentary, this is where it falls short. The mindset behind secular minimalism is to own only those items that add value to one’s life. That’s a great starting place, but if it becomes our final destination, we end up self-absorbed. At first, as I asked myself, “Does this box of miscellaneous power cords from 1995 add value to my life?” I felt free and empowered. “No! I can get rid of it! It’s my life. I don’t have to live with junk that weighs me down!” Then one day worshiping in church, it struck me. Actually, it’s not my life. My life belongs to Jesus. Thus my ultimate goal in minimalism should not be adding value to my life, but more fully valuing the things Jesus values. In other words, an efficient, organized home is a perk, not a purpose. My purpose is to minimize earthly things so I may more clearly see and pursue eternal things. If you want to take steps toward minimalism, I suggest starting in the area where you feel the most overwhelmed. What is taking over your home? Is there something crowding you out of your own life or distracting you from the things that really matter? Tackle a small project each day—clothes, toys, the junk drawer—and be abundantly patient with yourself. Once I made it through the home, I began considering how I might take a minimalistic approach to technology. The more I valued simplicity, the more I became aware of the endless “dings!”, updates, notifications, noise, mindless scrolling, and constant interruptions. Some of it added value to my life, but most did the opposite. It distracted me from the valuable things already in my life—the kids who groaned, “Put away your phone!”, the Bible waiting quietly beside my computer, the silence and solitude I desperately needed. How could you set boundaries around the use of technology in your home? Is there some form of technology sapping your soul? How could you take a break from it or cut it out completely? First Peter 3:4 urges women to seek “the imperishable beauty of a gentle and quiet spirit, which in God’s sight is very precious.” Having a “quiet spirit” means having a still, peaceful heart. A heart that is at rest. I long for such a spirit! Don’t you? Most days, my heart races with anxiety and noise. It’s not just the external chaos, it’s the internal chaos—the insecurity, expectations, inadequacies and unknowns. Amazingly, as I create margin in my home, I’m discovering margin in my mind. 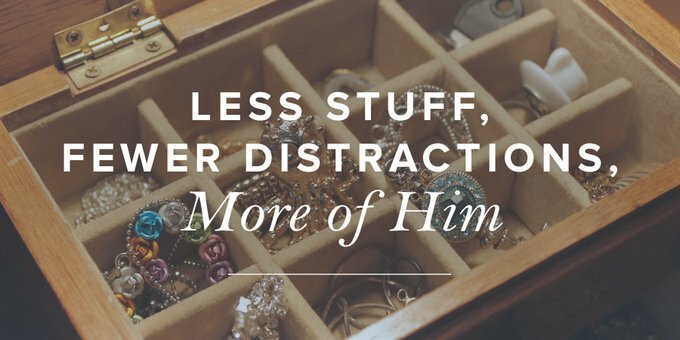 Less stuff, less noise, less distraction. I have a long way to go, but I’m confident of this: If you and I keep Jesus as our goal, we won’t veer off course. We won’t exchange idols of materialism for idols of organization. We won’t trade worshiping stuff for worshiping self. Instead, by His grace alone and in His arms alone, we will finally find quiet.